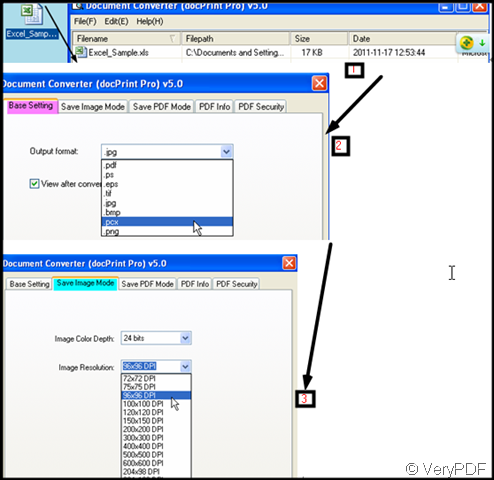 If you need do the converting from Excel to pcx or Excel to image, docPrint Pro will be a good assistant in this aspect. 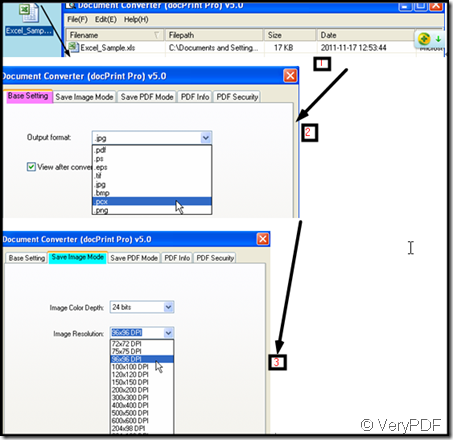 In this article, I will show you a method about the converting from Excel to image by docPrint Pro. docPrint Pro is both a converter and a printing driver. It also has the command line version. You can choose the right one for you. Take converting Excel to pcx for example, I will show you how to use docPrint Pro GUI version. When it comes to printer, we will relate it with the paper form file. docPrint Pro as its name implies, it also can get the same effect as printer that you can show your file in form of paper file form on the screen. 1.Once you add your file to it and make your options, the converting process will proceed automatically. So first all of adding Excel to it. Dragging them from its folder to the blanks is the easiest to finish the adding. 2.Set the target file format by clicking the button setting then go to the base setting label, you will find a drop down menu list, choose pcx there. If you need to adjust the color depth and color resolution, please go to the save image mode label. Click the button ok to back the main interface. 3.Click the button start to choose the folder to save the pcx file and activate the processing. A few seconds later, you can find the pcx in the chosen folder. The process can be illustrated like this following picture. How to convert MS Office document of xls to bmp using Document Converter? How to convert MS Office document of xls to jpg ? How to convert MS Office document of xls to eps file using Document Converter? How to convert MS Office document of xls to postscript file using Document Converter? How to convert MS Office document of xls to ps using Document Converter? How to convert MS Office Excel to png using Document Converter? How to convert MS Office Excel to bitmap image using Document Converter? This entry was posted in docPrint Pro and tagged docPrint Pro, Excel to image, Excel to pcx. Bookmark the permalink.